Nicholas School Dean Bill Chameides proposes a tougher pay back rule than our proposal of 1 GPM: He proposes that any new car needs to pay back the carbon debt in about 2.3 years of driving at 13,000 miles per year. Put somewhat differently, this requires a payback over 30,000 miles of driving to be carbon neutral. (We proposed that a new car pay back over 70,000 miles, which, at 13,000 miles per year, is a maximum of 5.4 years). .... to merit a voucher. 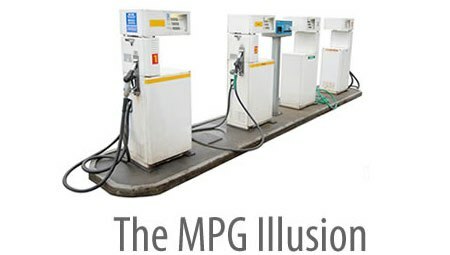 Of course, because of the non-linear relationship between CO2 reduction and MPG, there is no simple rule about MPG increase that captures these changes. Let's translate it to GPM, which is linear in CO2. The Green Grok standard equates to a 2.5 GPM principle: A new car needs to save 2.5 gallons of gas every 100 miles compared to the original car to be carbon neutral. This table shows the gas (and cost) savings from trading in a low MPG car for a higher MPG car (available at this post). The savings are calculated over 10,000 miles of driving. As you look at our table, keep in mind that reducing gas consumption by 100 gallons saves a ton of CO2. One must save 700 gallons of gas to "pay back" the carbon dioxide emissions when manufacturing a new car. Finally, note the (necessary) connection between our gas savings table and Dean Chameides' pay back table. The MPG combinations that yield a 2.3 year pay back in his table are the same as our MPG combinations that yield gas savings of roughly 240 gallons over 10,000 miles, or 2.4 gallons per 100 miles.